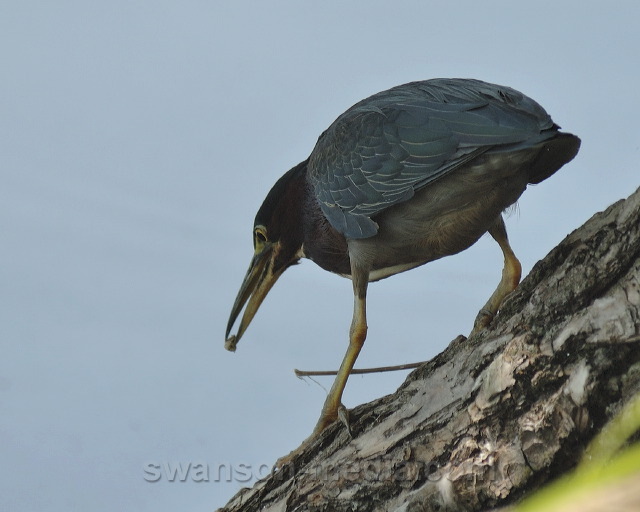 A Green Heron (Butorides virescens) prepares to drop an object (presumably a small piece of bark) into the water to entice fish—a fascinating example of tool use in birds. Using found objects as fishing lures (sometimes called "bait fishing") is considered a learned behavior in green herons, practiced by only the most intelligent individuals. This photograph is available as a museum-quality print suitable for framing. Prints are sold for display use only (home or office). If you wish to reproduce this image you must request a license (see below). You can adjust quantities in the shopping cart. If you order multiple prints, the shipping price is incremented $1.00 per print. See About Photo Prints for information about image sizes, borders and framing suggestions. Prices are in US dollars. Your payment will be processed through PayPal, which accepts all major credit cards. To license this image for editorial or commercial use, please complete the License Fee Quote Request Form. Be sure to make note of the Image ID Number above. Commercial licenses might not be available for some images that lack model or property releases.